One of my students has come back afer a debilitating illness, and had been preparing to play a senior recital. I have one hour lessons with her, and she can't yet hold the flute for more than five minutes. The illness has left her quite weak. What kind of things can we do in lessons as she gradually recovers (besides listening, of course). Ideas that would help prepare for her (probably simplified) senior recital would be helpful also. Thanks for your input. A. 1. Patricia George's idea of "Right hand on the barrel"
for those re-starting flute after a hiatus. added gradually (footjoint remains off). your own improvisations during lessons. embouchure and balance of the hands. and comfortable sense of hand-balancing. don't need, in order to develop a fluid technique. This kind of highly relaxed playing (learning when to release muscles that aren't needed) is useful at any time in a flutist's career also. as shown at my Jessica Walsh Duets page. enough not to tire or create bad-habits. entertaining in lessons, even with advanced students. 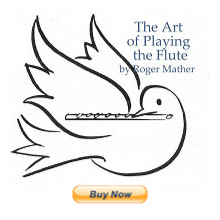 advise you work through the book "The Physical Flute"
to relearn to play without excess effort. speed and lung support to naturally improve. 8.Watching videos of flutists may be useful. See list of online videos from last week's blog. Part of getting back a skill is observing others who are at their full ability levels. This is the concept behind "Inner Game of Tennis", "Inner Game of Music". Watching recitals and performances also give energy to thrive and improve, I find. worthy of being shared in lessons. Using other simpler compositions she could demonstrate flute techniques,compositional techniques, or instrumental blend etc. Discussing the interaction of the chamber group's lines of music would also be interesting. Any other ideas you can share on keeping from having sore muscles after only a few minutes? I keep my elbows down and try to relax, gently stretch etc., but it's sometimes not enough. 2. Look for release places in the music. A guitarist I once lived with (during college we shared a flat) discovered from reading "Le Violin d'Interieur" that there are releases in every gesture in music; it's always TENSION, and then release. Hypothetically you can be completely releasing every other bar or so. Look for complete moments of relaxation within the act of making music. 3. Move while you play. Move deliberately. When we move, the muscles no longer have to hold in static positions. If you walk around the room while warming up your longtones, if you deliberately play up to the ceiling (look up and follow the gesture with your flute) or make slow, easy circles with the flute, you will give the muscles more blood flow, and relieve static tension. I use this deliberate slow motion WHILE I'm playing, especially when doing long slow notes.